Electro Partners can offer you the following on board repairs. General repairs to main switchboard, control panels and general electrical systems. Repairs to smoke detection and smoke-sampling systems (Kidde, Thorn, Ginge,...). Repairs to alarm-and remote control systems. Repairs to oil mist detectors (Graviner, Daihatsu,...). Repairs to oily water seperators and 15PPM monitors (Deckma, Babcock,...). Thermo-graphic survey of main switchboards. Generator control, synchronizing and protection systems. Conversion from reactor-transformer controlled voltage regulators to full thyristor controlled voltageregulators. 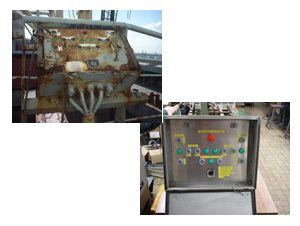 Repairs to cargo cranes (electric-electronic and electronic-hydraulic).